This was a great story. So let me talk about what I didn't like first and get it out of the way so I can end this review with the good stuff. Having heard lots of great things about Sarah Dessen, any and all of her books sat on my TBR for awhile -- to the point that whenever I found a good deal on one, I bought it. Hence, I own at least 4 and had never read one. For our BookNerd Lent Challenge, I finally picked up The Truth About Forever. And I didn't like it -- mainly because the majority of the part of the story that I made it through was spent in flashbacks and not forward motion. Unfortunately, I discovered with Lock and Key that this is Sarah Dessen's writing style. I do not know what she has against chronological order. But Lock and Key skipped around SO much. It was present, then it last week, then it was present, then it was this earlier morning, then it was two days ago, then it was when Ruby was a kid, then it was present again. Seriously?!?! Please explain to me the need to write a scene happening in the present and then flashback to a time period that was earlier that morning?!?! I don't understand! Can you not just start the story in the morning and carry on with the day?!?! As you can tell, this lack of chronological order annoyed the CRAP out of me. But I came to love these characters. Each and every one of them. Ruby. Cora. Jamie -- how can you NOT love Jamie?!. Nate. Olivia. Gervais. Like Jamie, I was pleasantly surprised with how well Ruby transformed. But she wasn't the only one -- Cora, Gervais, Nate. 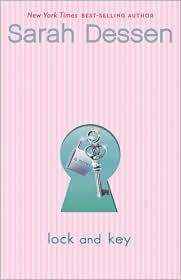 I liked the themes in the book, how it discussed the idea of family and how the idea of the key was woven into Ruby's journey. I finished this book with a smile on my face, so happy that all these characters who I now loved were going to live out happy endings. So, will I read another Sarah Dessen book? Maybe. But honestly -- I don't know. Lock and Key is a stand alone contemporary YA novel. That sentence alone should tell you this is not your typical YA book. The protagonist, Ruby, is a 17 year old girl who is a senior in high school. She has been living alone for ten years with her mother who is divorced, has a substance abuse problem, and is clearly not a good role model. She attends school all day and helps her mother work in the evenings just to meet their basic needs. Living under these circumstances has left her very guarded and suspicious of others. One day, her mother abandons her without warning. The authorities ultimately figure this out and contact her sister Cora. Cora is 10 years older than Ruby and has not been a part of her life since she went away to college. She is now an attorney and is married to Jamie, who hit it big with an online social networking site. When Ruby goes to live with them, her life is turned COMPLETELY upside down. She is now living in a wealthy neighborhood, attending a private school, and has everything she could possibly need or want. Family is a theme that is continuously explored throughout the novel. As Ruby begins to unravel the truth behind her own family, will she be able to overcome her upbringing and begin to thrive in her new setting? Will she be able to trust others and develop the social contacts she so desperately needs? Cora, Jamie, Nate, and Olivia were all amazing characters in their own right. Ruby learns that everyone has their own struggles. The seemingly perfect lives that some people may appear to have are not always a reality. Through friendship and a willingness to offer and accept help from others, these characters are able to make tremendous strides in their own lives. I can understand Flo's point about the time periods bouncing around, but I thought it worked in this book. The flashbacks provided a glimpse into Ruby's prior life and allowed us to see why she is the way she is. I will have to agree that a flashback to earlier that day was a bit excessive and confusing at times, but the flashbacks to her life prior to moving in with Jamie and Cora definitely added value to the story. I will absolutely read another Sarah Dessen book, most likely sooner rather than later. Great review. I really enjoyed Lock and Key myself. Thought the story was really well told. I am glad you enjoyed it as well. Let me know if you have read any other Dessen books that you would recommend.